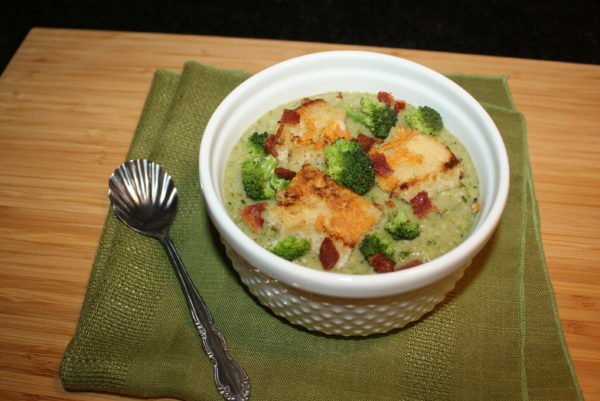 What I love about this recipe is that you can adapt it any way you'd like. Use bacon. Don't use bacon. Use cheese. 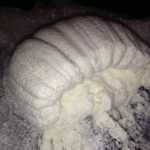 Don't use cheese. 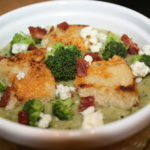 I'm lactose intolerant so this recipe was right up my alley. 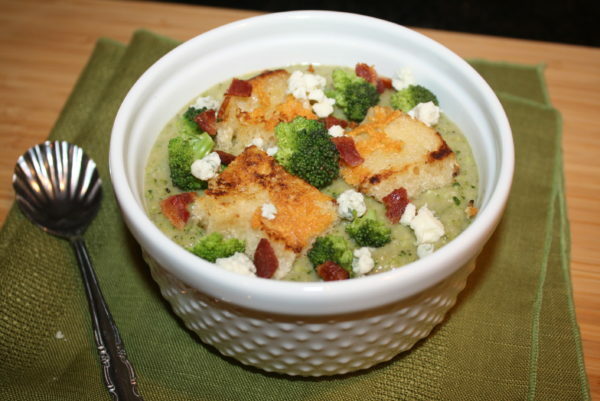 I'm also vegetarian; however made this with bacon so that I could share it with everyone else. It was wonderful and I would make it 100 more times. A huge thank you to Tammy Upshaw who gave me my first Dutch oven. It works wonders. 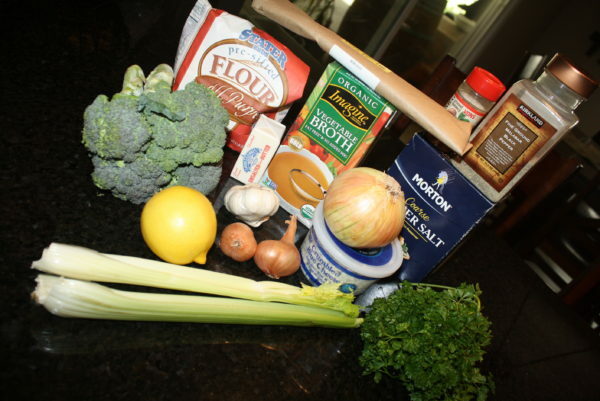 Line up all your ingredients on the counter for preparing your soup. 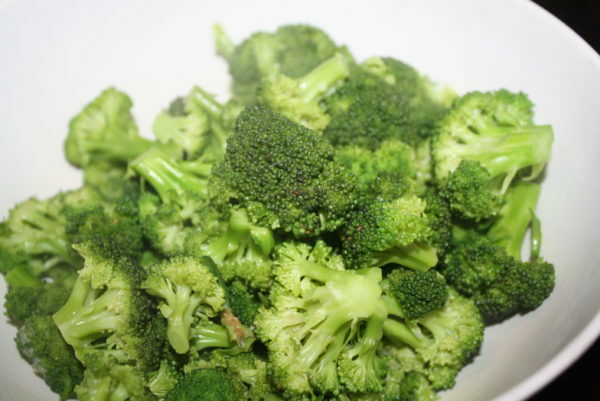 Rinse broccoli and cut florets from broccoli stems; chop florets into bite-sized pieces. Trim away and discard the woody outsides from stems, then dice stems. Heat broth in a saucepan to boil. 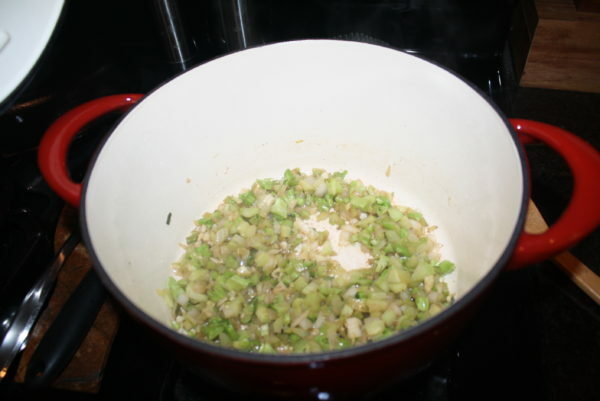 Add florets, reduce heat to medium, and boil until crisp-tender, 2-3 minutes. 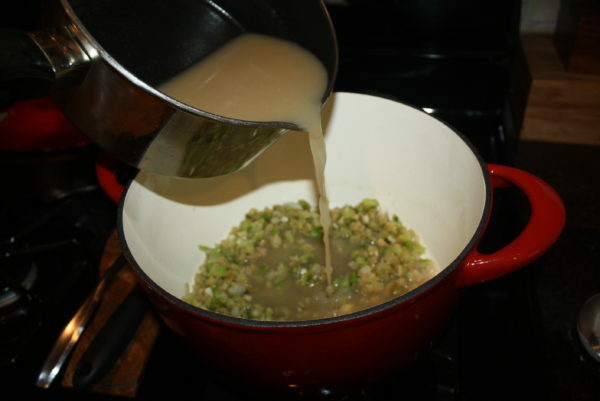 Transfer the cooked florets to a bowl; reserve broth off to the side. 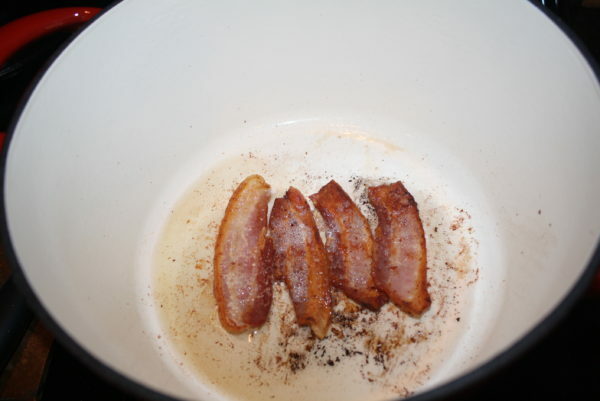 Cook bacon slices in a pot (Dutch Oven) until crisp. 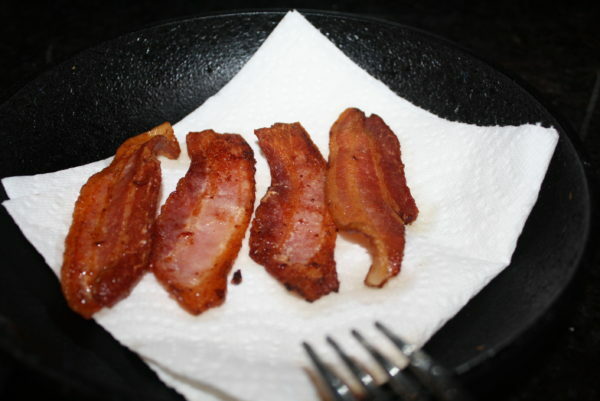 Transfer crispy bacon to a paper-towel-lined plate; save the bacon grease in the pot. About 2 Tbsp. 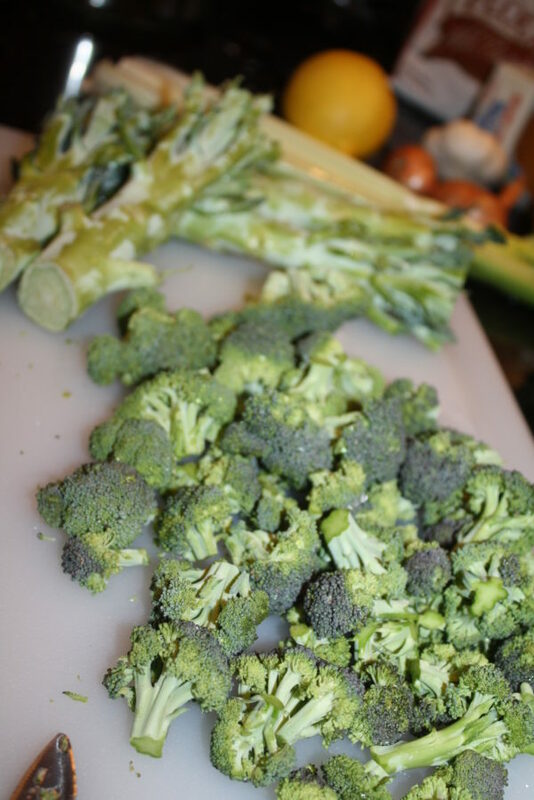 Cut all of your raw vegetables in advance to save you time. 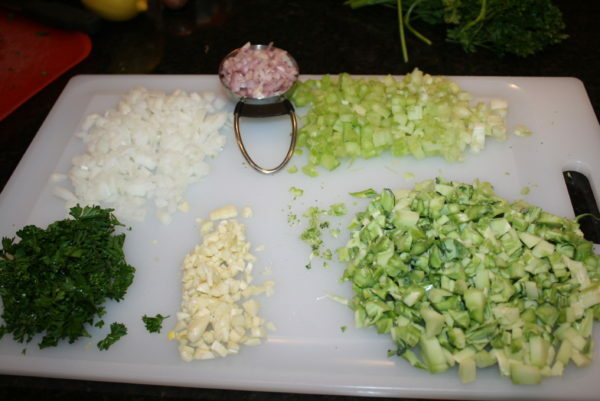 Chop up your onion, celery, garlic, parsley, and scallions. 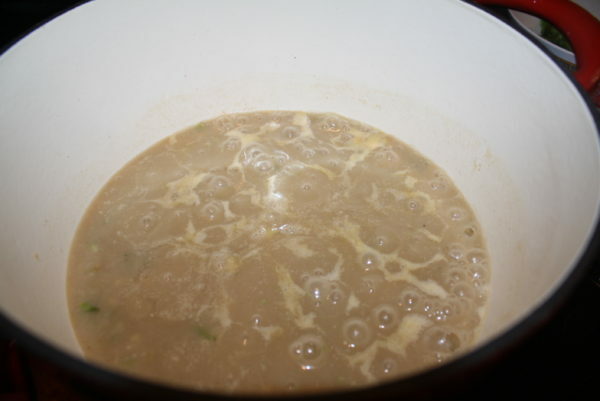 Melt butter in the pot with bacon drippings over medium heat. 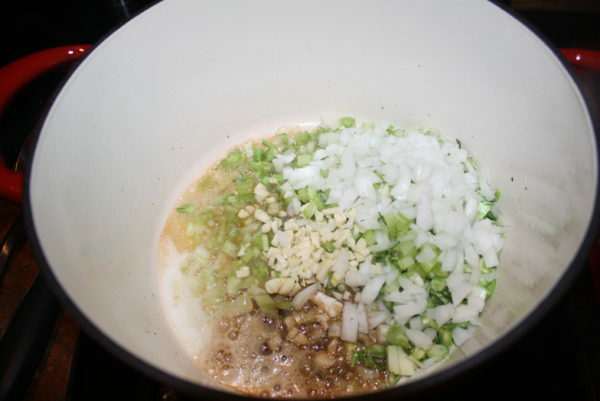 Add in onions, celery, garlic, and diced broccoli stems. 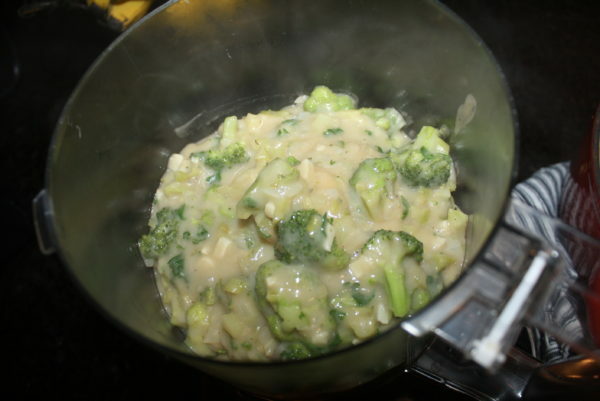 Cover the pot; and sweat vegetables until softened, about 5 minutes. 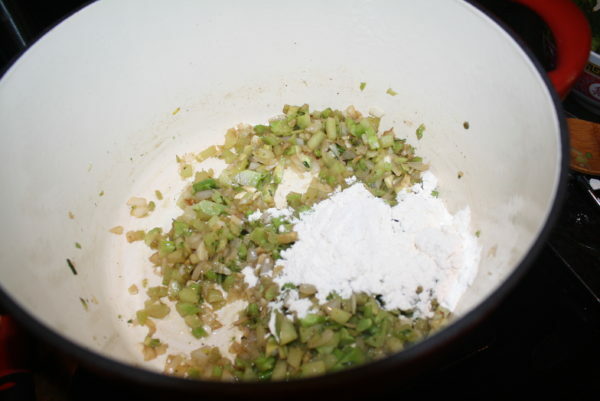 Whisk in flour and cook 2 minutes. 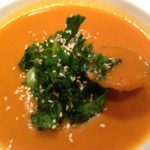 Whisk in reserved vegetable broth, scraping any brown bits, and bring to a boil over high heat. 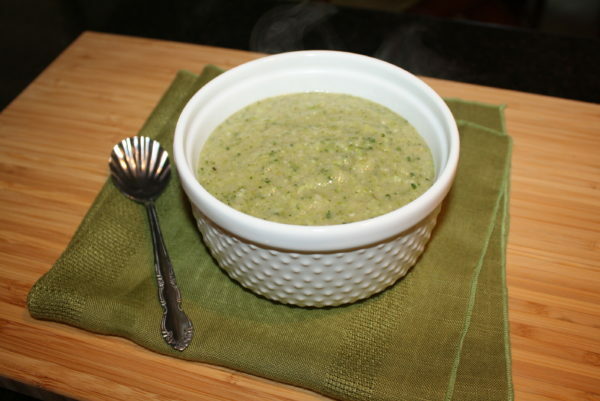 Reduce heat to medium-low and simmer soup until thick, 2 minutes. 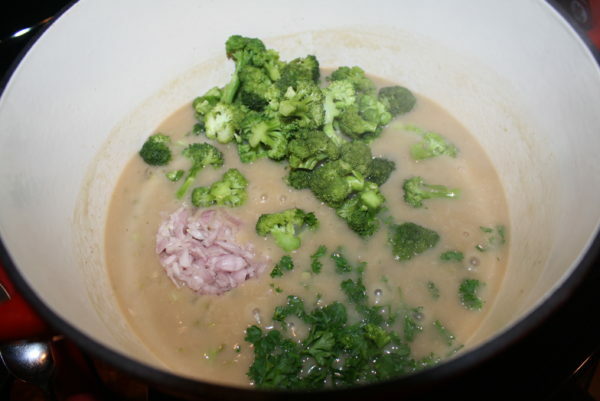 Add in parsley, scallions, and half the broccoli florets. 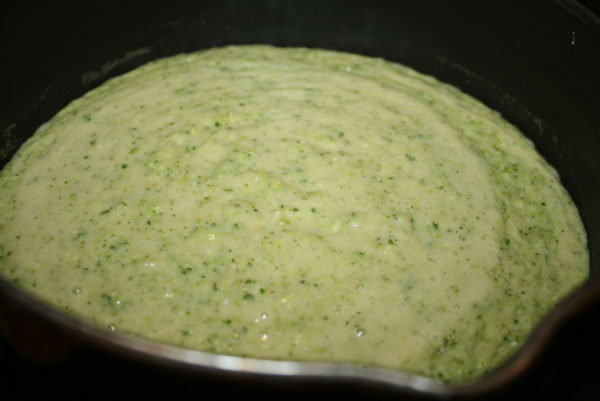 Simmer to heat through, 3 minutes. 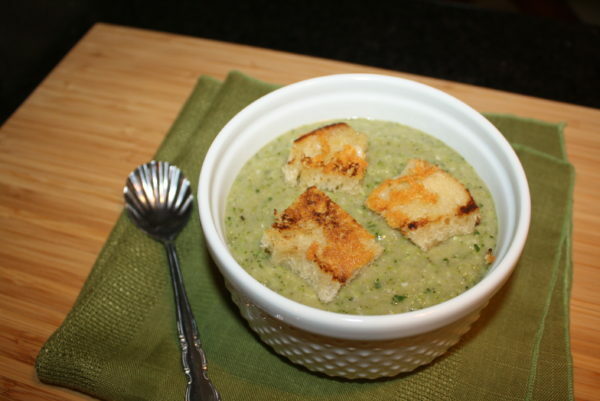 Purée soup in batches in a food processor or blender and return the soup to the pot over low heat to add in the garnishes and prep the croutons. 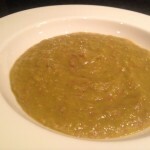 I used a squeeze of lemon, about 1 tsp. 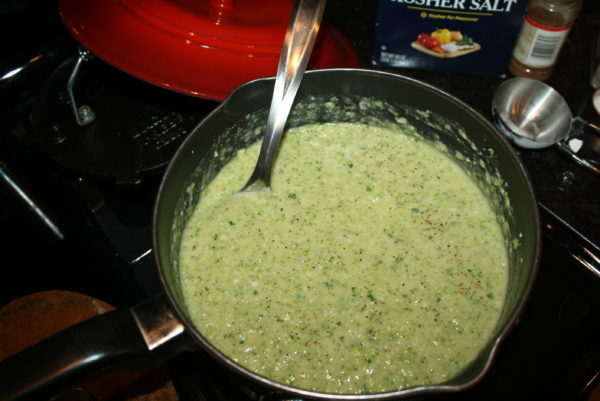 of kosher salt, 1 tsp. of cracked black pepper, and a dash of nutmeg. 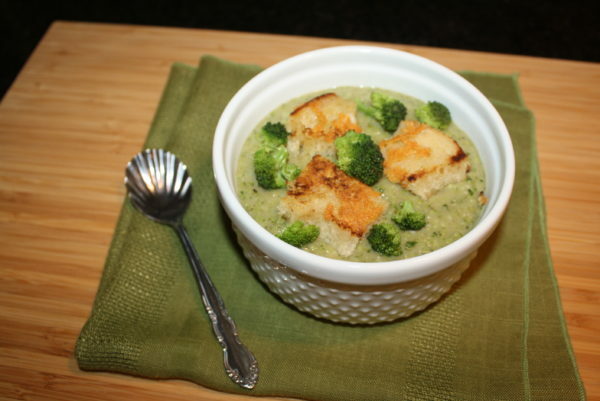 You can toast up baguette slices or make homemade croutons like I did. 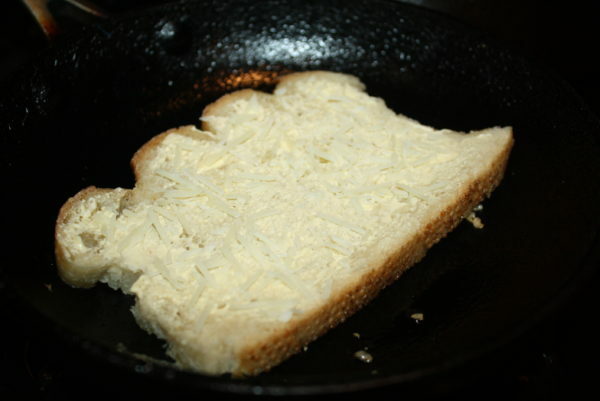 Butter both sides of a slice of sourdough bread and press in shredded Parmesan cheese onto both sides of the buttered bread. 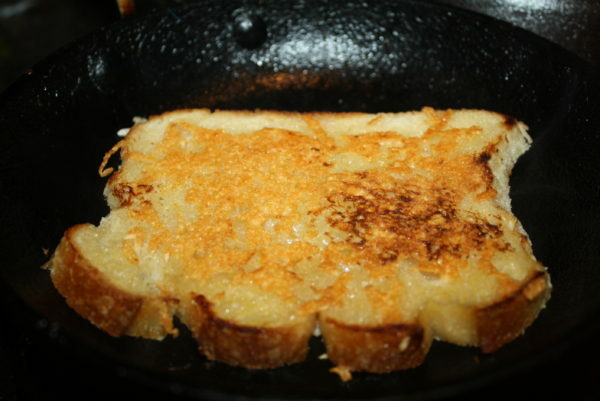 Over medium to high heat, cook the bread until crispy on both sides. Lay out your garnishes, cut up the bacon and the bread. 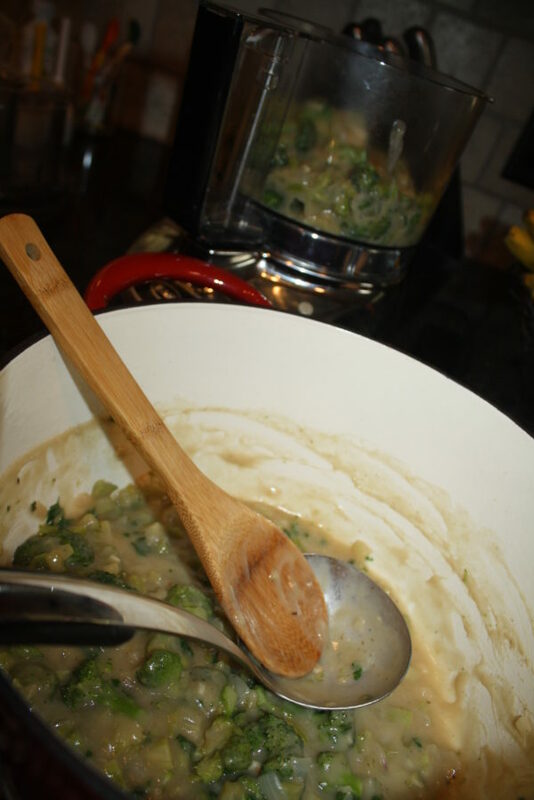 Using a ladle, scoop in a cup of soup into a bowl. 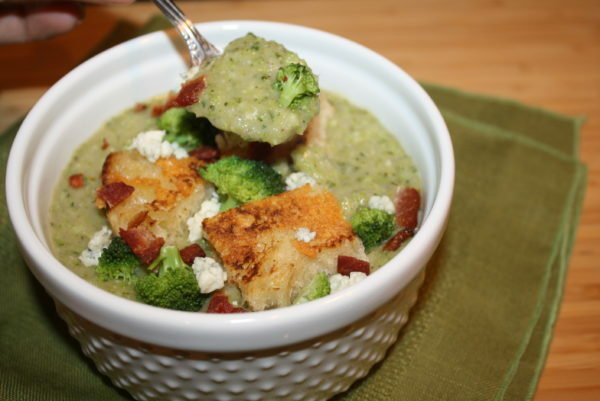 Add in 3-4 cubes of cheesy toast. 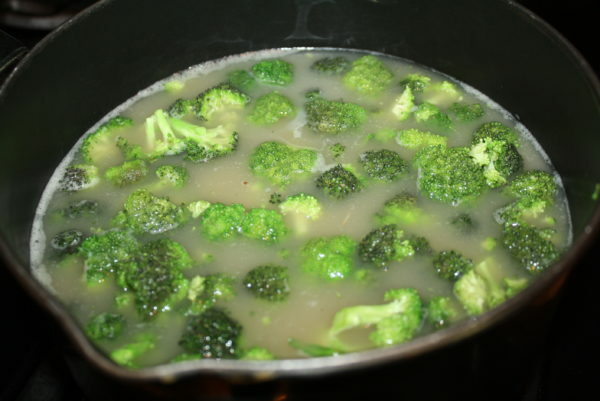 Add in 6 or more reserved broccoli florets. Sprinkle in some crispy bacon. 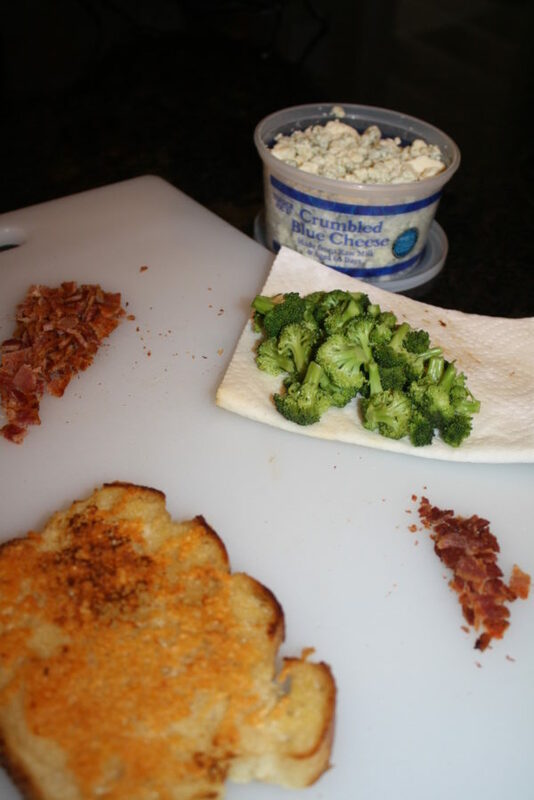 Crumble in some blue cheese crumbles. Take a big bite getting all the fixens on each bite. 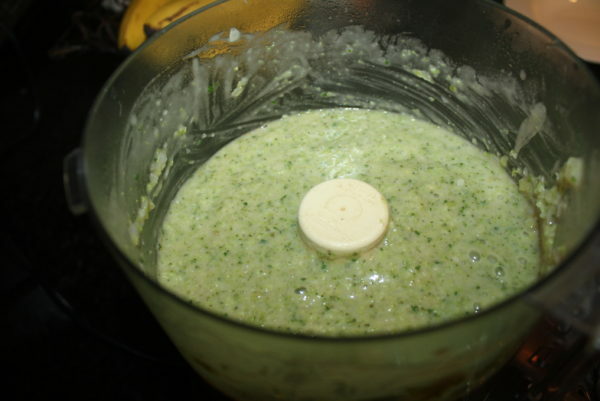 If you would like a thinner soup, you can add in 1/2 cup of water before putting soup into the food processor. If you don't eat meat, use 2 additional Tbsp. of butter instead of the bacon grease. 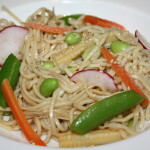 Inspired by Cuisine at Home Magazine. 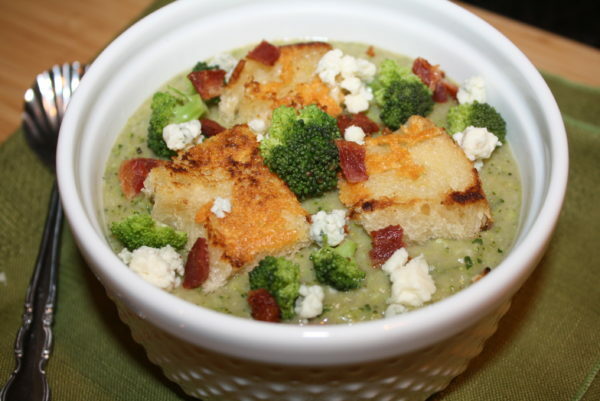 Issue 115, February 2016 - Creamy Broccoli Soup with bacon & blue cheese.